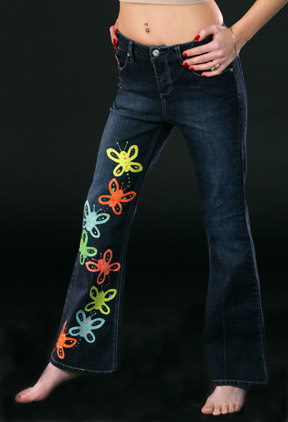 Feel like a celebrity star in these hand painted, one of a kind jeans - a must have in every girl's wardrobe! These custom painted jeans were designed by the world renowned artist - Kathyrn. Liquid latex offers a smooth finish when painted on denim. Paint will stay on wash after wash. Liquid latex will not run or fade like other "paint" products.